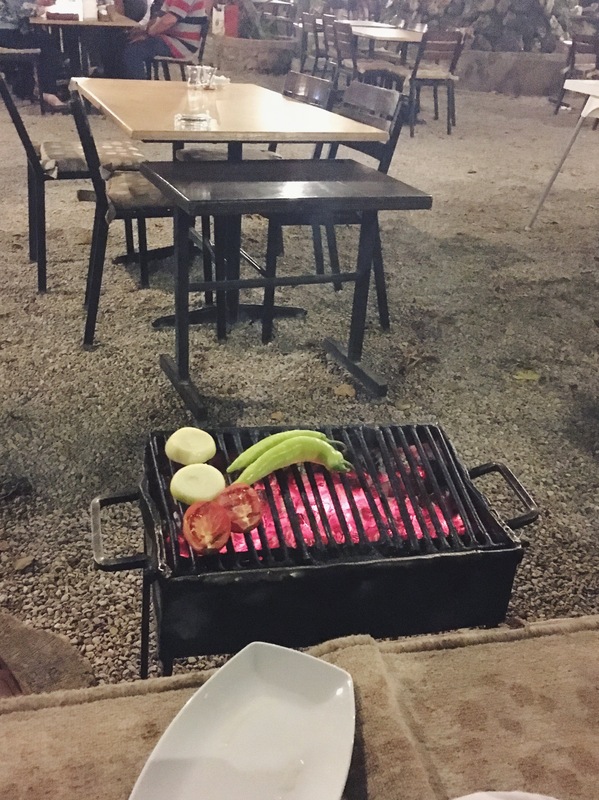 Everybody knows our favourite thing to eat in Turkey is a BBQ. 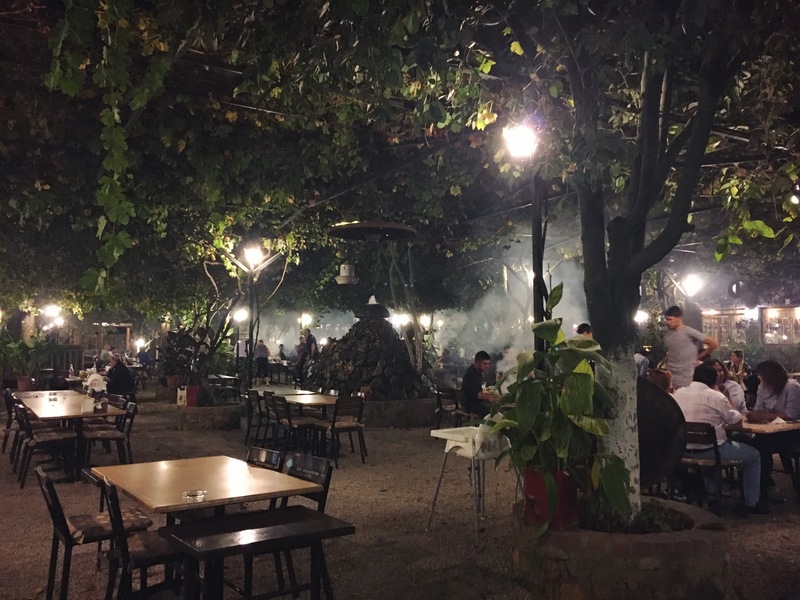 But sometimes after a long day you don’t want to pack up everything, head to a BBQ spot, set it all up and then do the washing up afterwards, which is where this restaurant in Kayakoy, called Cin Bal, comes in. It’s a lovely restaurant, well known and well sign-posted in Kayakoy village. It’s not your usual restaurant though as there is no menu as such. 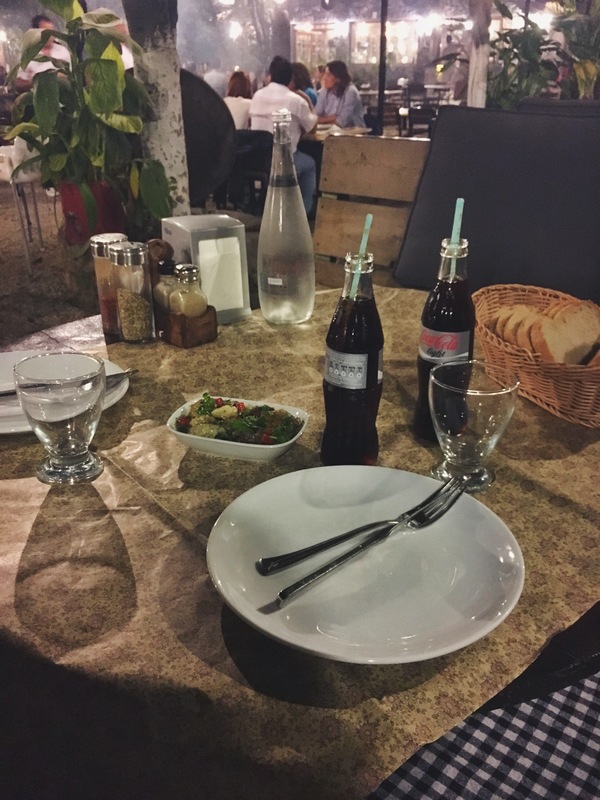 You go in, chose your seat, either a standard table with chairs or a traditional köşk (a wooden seating area with lots of cushions and a low table) and then walk into the restaurant and chose your food. As there isn’t a menu the options vary. There are usually lots of cold meze’s to choose from which you can view behind the glass fridges, and then you chose your meat. They have all sorts of meat, including lamb, chicken and beef. You buy the meat by the kg, which means you can easily overeat…We had peppers, onion and tomato, aubergine salad, steak, lamb skewers, chicken wings, meatballs and sucuk between the two us which was way too much, but we still finished all of it! 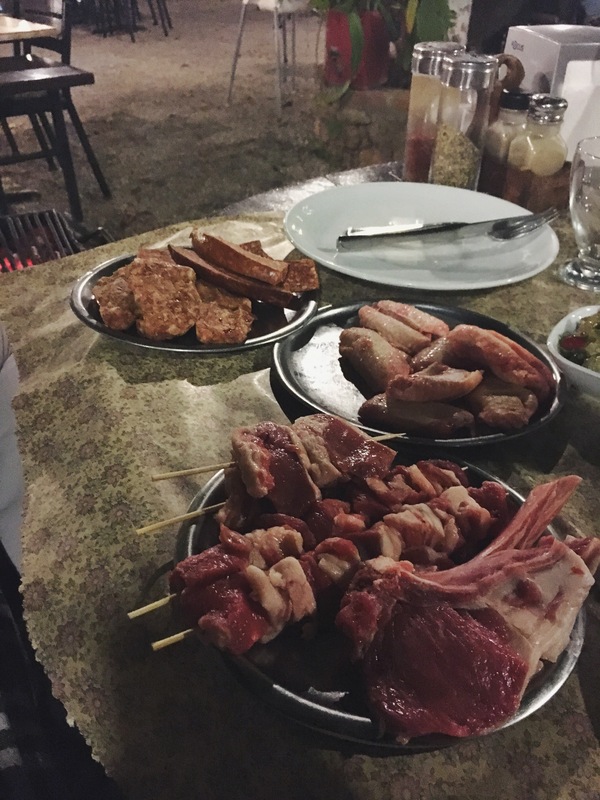 Once you’ve chosen the meat, you either get them to grill it on their BBQ for you, or they bring the ready-lit BBQ to your table, along with some tongs and the plates of meat and you can cook it all yourself. A lot of people aren’t keen on the concept – why would you want to cook your own food? Maybe, if you’re on holiday it’s a bit weird, but for locals, weekly family BBQ’s are a great way of socialising and getting together, especially on Sunday’s – this restaurant gets very busy at weekends. 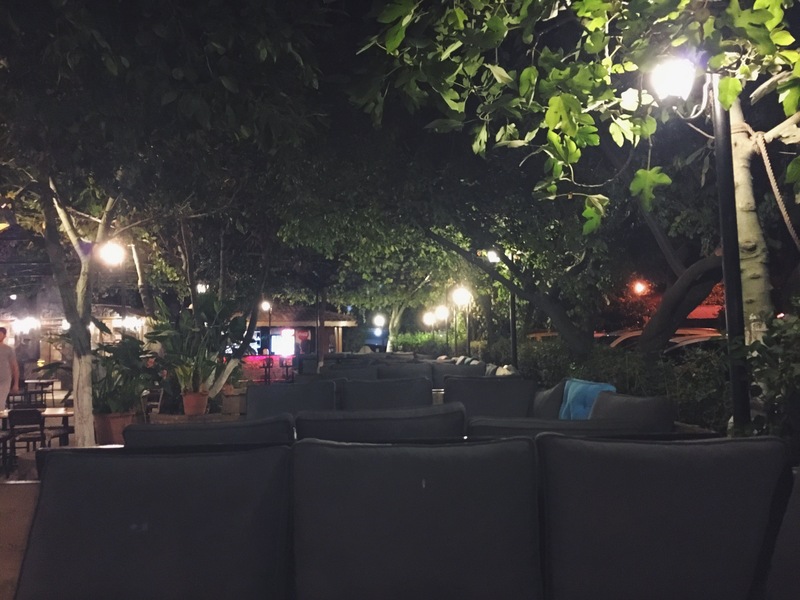 I love the whole atmosphere of BBQ’s with everyone sitting around chatting while grilling and enjoying the food as and when it comes fresh off the grill, and Cin Bal definitely has the perfect atmosphere. You can see from my photos the smoke coming from the BBQ’s under the lights and the smell of it all is just amazing! We’ve never been in the height of summer, so I expect that is a whole different experience, but we have been twice in October when things are a little chillier. 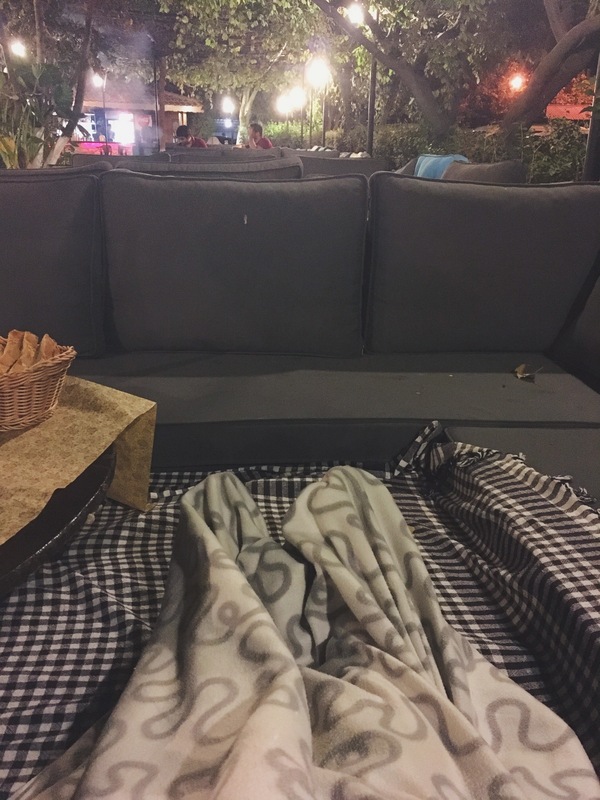 It was late evening at the start of October when we went and as Kayakoy is higher up than Fethiye and Calis it does get quite a lot cooler, but luckily they have thought of everything and have blankets and shawls you can use to keep warm if needed! I was sat all snuggled under the blanket while Berkay slaved away cooking… Oops. It’s definitely worth a visit whether you chose to have the food cooked for you or like to cook it to perfection yourself. All the great atmosphere and taste of a BBQ without any of the washing up and mess afterwards! Perfect.